Contemporary public sculptures beam into the city, present a fleeting look-at-me spectacle, invite a selfie peeping over your shoulder, then often move on. The sculptures that appeared in the heady, idealistic years after 1945 seem very different - far more contemplative, less staggering, more permanent. Indeed, though very unlike today's eye-candy, the curious forms of post-war works deliberately contrasted with the rectilinear volumes and spaces of the brave new modernist Britain. Furthermore, as the exhibition Out There highlights, much of it was temporary too, because it has been destroyed or stolen. Out There is Historic England's first major exhibition since rebranding made history of its English Heritage name. Curator Sarah Gaventa revealed that she had just five months to prepare it, making her run around so much that it was 'the curatorial equivalent of being in a Benny Hill show'. Nevertheless, she's brought together an extraordinary collection of works, photos, film, maquettes, catalogues and press clippings, even trawling eBay as a source. Her survey, particularly of the earlier part of the 1945-1985 period, is deftly divided into didactic sections. We start with Brave New Art, taking us back to when artists, many of them Jewish émigrés, emerged from arcane art circles to display their work in daylight for everyone to enjoy. The first London County Council-sponsored Open Air Sculpture Show in 1948 drew a crowd of 100,000. Hugh Casson insisted that art was woven into the Festival of Britain. 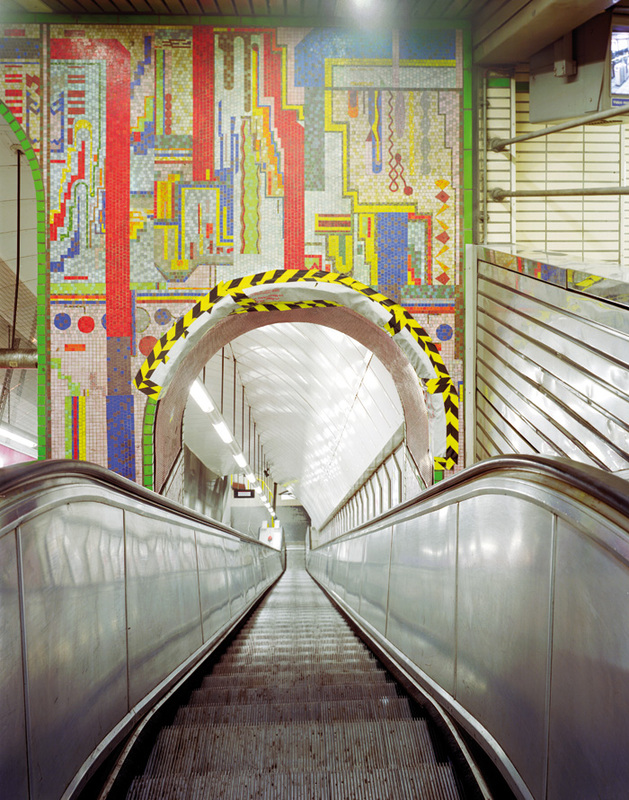 It sported 30 sculptures and 50 murals, included Powell & Moya's Skylon. That was trashed in 1952 on Churchill's orders, and most of the rest was lost. In the Fifties, Harlow went so big on public art that the show gives the new town its own room. The town's architect, Frank Gibberd (who designed Liverpool Metropolitan Cathedral and Heathrow's lost brick terminals) said his civic centre should have 'the finest works of art, like Florence and other splendid cities'. Strangely, on a 1956 film clip on show, he comes across as slightly shifty, not meeting the interviewer's eyes, yet jolly British at the same time. Still, there's no doubting the legacy - a veritable who's-who of British sculptors embellished Harlow, including Lynn Chadwick, Gerda Rubinstein and Barbara Hepworth (just as art was reportraying women as mother figures). Hepworth's two-storey Contrapuntal Forms (1951) tower like sentinals up close to housing. 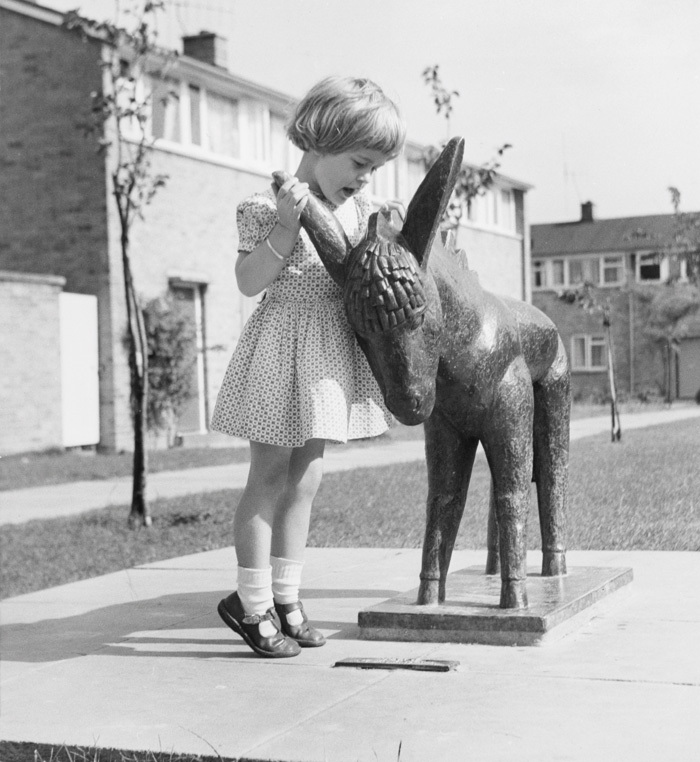 Willi Soukop's gentle Donkey (1955) and Elisabeth Frink's nervy Boar (1970) brought animal spirit into Harlow, while Ralph Brown's Meat Porters (1959) brought a carcass to centre stage in Market Square. Gibberd's Water Gardens has seven extraordinary 1963 murals by masterful William Mitchell, with a Picasso-meets-Aztec sun-god energy. Today Harlow has 65 sculptures, but six more have been stolen, some melted for black-market metal. London's commercial buildings have long-mounted sculptures, but post-war conceptual forms were a far cry from earlier figures. An exhibition treat is a Fifties' model of Basil Spence's Thorn House, complete with an early version of Geoffrey Clarke's Spirit of Electricity mounted on the 61m-high skyscraper, as well as a maquette and sketch of it. This fantastic 1961 bronze of filaments and crescent skewered on a 23.5m-long spine still hangs, but on the fridge white Orion House now there. Spence often commissioned art for his building designs, but his Hampstead Civic Centre, at Swiss Cottage, London, has been lost, along with the blocky, brutalist yet dynamic floating walls of Sun Terrace (1964) by Mitchell, who talks about his lost masterpiece on film. Almost goners, but restored for the show, are two other examples of what Gaventa calls Sculpitecture - architectural relief murals favoured in the Sixties. One is Trevor Tennant's New Horizons (1963), an almost geological wall, which long lurked behind a Welwyn Garden City hospital vending machine. The 1972 City Sculpture project, backed by a tobacco firm, peppered big works nationwide. There's a model of Liliane Lijn's beautiful White Koan, one of her trademark revolving cones but 6m high, which graced Plymouth (later moved to Warwick University). The groans of its whirring motors, she once told me, meant 'it had a voice!' The 5.5m-high King Kong by Nicholas Munro in Birmingham presaged the pop-sensationalist works of more recent times. Several fascinating stories are unearthed, such as that of the CIA-sponsored Unknown Political Prisoner sculpture competition (1952) and the recent battle of councils and campaigners for Henry Moore's Old Flo (1957-8). The wanton destruction of Barry Flanagan's Piece For the City (1972) by Cambridge students backed by a philistine vicar, for me, chillingly pre-echoes Islamic State and Palmyra. Historic England has recently listed 41 post-war public artworks up to 1985, but the show has half a wall of panels about lost and destroyed works. There's many more out there. In an age when a fresh Banksy mural can be lifted overnight, we're reminded that vandals and thieves have always stalked art, and that England's post-war public legacy is vulnerable. Out There brilliantly reassesses it, and issues a timely call: Save Our Sculptures!